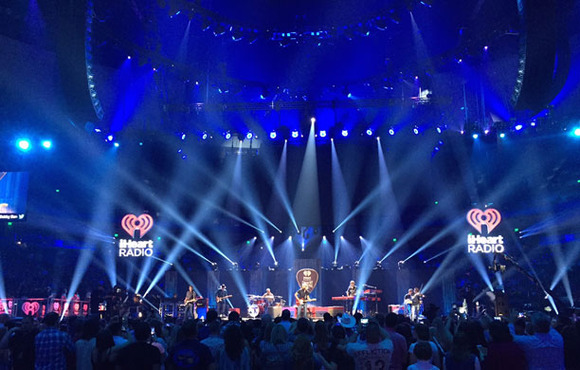 AUSTIN, Texas – For the second year in a row, Firehouse Productions provided sound reinforcement for the iHeartRadio Country Festival, held at the Frank Erwin Center in Austin, Texas. And just like last year, Firehouse used its HARMAN’s JBL VTX line array system for the event. This year’s system, however, featured Firehouse’s V25 loudspeakers, now upgraded to the new V25-II spec using JBL’s VTX-V25-WG-UK upgrade kit. With the upgrade, Firehouse was able to take advantage of this new and improved standard for one of the largest country music festivals of the year. The iHeartRadio Country Festival brought together the biggest names in country music on one stage in a venue that seats more than 16,700 people. Hosted by country music personality Bobby Bones, the lineup this year featured Tim McGraw, Brantley Gilbert, Rascal Flatts and Brad Paisley. While Firehouse Productions is accustomed to the standard basketball arena setup, it did not take this event lightly, as the team aimed for maximum clarity and intelligibility in all directions. To this end, Firehouse provided two hangs of 18 VTX V25-II loudspeakers for the main PA, two hangs of 14 VTX V25-II loudspeakers for outfill, three hangs of nine VERTEC® VT4889 loudspeakers for rear fills, eight VT4886 loudspeakers for front fills and 18 VTX G28 ground-stacked subwoofers. The entire system was powered by Crown I-Tech 12000HD amplifiers. The VTX V25-II features a new 4th generation waveguide that improves long-throw performance and control. It achieves this through optimally combining a variety of design improvements, resulting in 10 dB higher sensitivity above 10 kHz.